Air Force Space Command recently posted a white paper regarding the Space Mission Force construct that was recently implemented within the command—the white paper has not been approved for public release, so what follows is a brief explanation of this AFSC construct. POV: How SATCOM As A Service Can Help The DoD Modernize Effectively And Affordably, By Rebecca Cowen-Hirsch, Senior Vice President, Government Policy, Strategy, & Outreach, Inmarsat Government Services, Inc. The US Department of Defense (DoD) is struggling to address modernization requirements within the spending limits directed by the Budget Control Act (BCA) of 2011. Throughout the space age, there have been many proposals for single-stage-to-orbit (SSTO) horizontal-takeoff-horizontal-landing launch vehicles that would make spaceflight similar to aircraft flights. In July of this year, the Association of the United States Army (AUSA) sponsored a “Hot Topic” event that was focused on Army networks and the next generation technologies that are a priority for the Army’s senior IT leaders and decision makers. Portable Products Must Exceed The Weight Of Expectation: A Spectra Perspective, By Simon Davies, CEO, Spectra Group (UK) Ltd. When discussions come to the subject of communications—especially tactical communications— the compatibility of new products with existing systems—size, weight and power and, of course, security —all have to be the key objectives within a highly competitive marketplace. For decades, the most secure and protected U.S. military satellite network has served both a strategic and a tactical purpose. 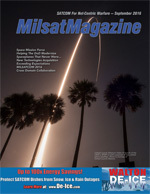 When discussing future MILSATCOM needs to protect nations and their citizens, one of the most important considerations is to be aware of what may be coming to harm or interfere with a national process and to know what tools are available to immediately offset such incursions.